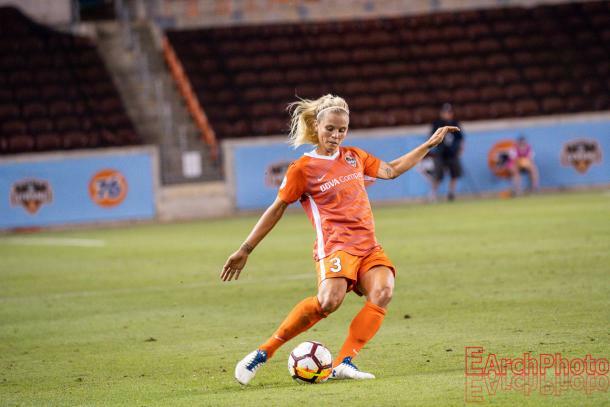 Rachel Daly added two assists in the Houston Dash win over the Washington Spirit Friday night in Houston, Texas. SCORE: 1-0, min. 41, Ohai. 2-0, min. 58, Huerta. 3-0, min. 76, Huerta. 4-0, min. 84, Simon. INCIDENTS: NWSL Regular Season match between the Houston Dash and the Washington Spirit. The match was played at BBVA Compass Stadium. 3,007 spectators. 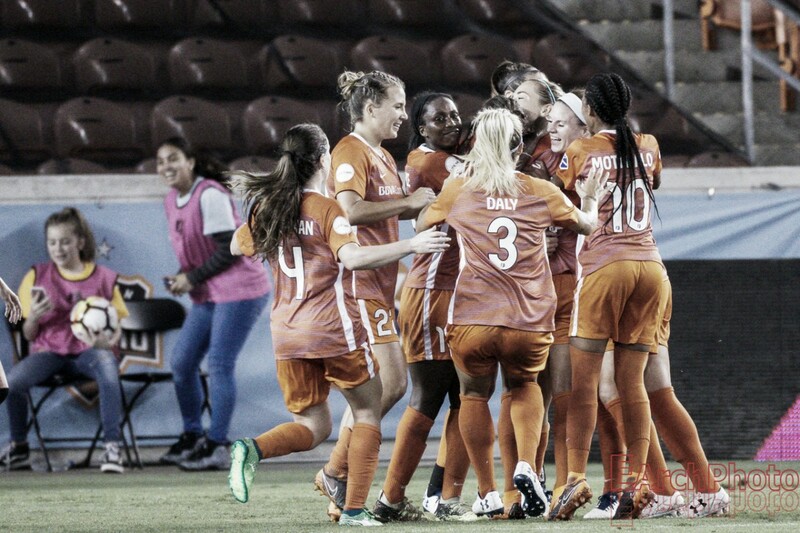 The Houston Dash are all of a sudden one point out of a playoff spot. With the win over the Washington Spirit, Houston pull into the sixth spot in the National Women's Soccer League standings with 29 points. Both the Orlando Pride (fourth place) and the Chicago Red Stars (fifth place) have 30 points. The Dash have fought their way back into the playoff race by winning three of their last five matches. Two goals from Sofia Huerta and tallies by Kealia Ohai and Kyah Simon gave Houston the much needed win. Houston will have to continue their winning ways in their last three matches for a shot at the post-season. From the opening kickoff the Houston Dash put pressure on the Washington Spirit backs. Houston’s dynamic duo of Ohai and England international Rachel Daly were on Washington’s backline the entire half. Both created many chances for each other or their teammates. If the duo was not springing the play, rookie teammate Veronica Latsko was jumping up into the play. Ohai and Daly would combine for eight shots attempts, two of which were on target. In the 41st minute, team captain Ohai would break through and score Houston’s first goal of the night. Dash counter attack started from defender Claire Polkinghorne to midfielder Linda Motlhalo, who sprung Daly down the left side. Daly sprinted down to the left side of the box where she centered to a wide open Ohai, who place a right footed shot to the lower bottom of the net past Spirit goalkeeper Aubrey Bledsoe. The Dash would go into halftime with a 1-0 lead. The Spirit had some chances in the half but could not string together any connection passes in the final third. The young triple threat of Mallory Pugh, Rose Lavelle and Andi Sullivan had some moments of promise but could not finish. Former Chicago Red Stars, Sofia Huerta and Taylor Comeau would double the Dash lead in the second half. In the 58th minute, Huerta brought the ball down feeding it to Comeau on the right flank. Comeau took on her defender into the box which drew another Spirit defender toward her. Comeau slide a pass back to a wide open Huerta who rocketed an upper 90 right footed shot past Bledsoe. Huerta would score her brace and Daly would register her second assist of the match in the 76th minute. This time Daly had the ball on the right side of the box. With some nifty footwork around her defender, Daly found Huerta near the penalty spot who was able to touch the ball home making the score 3-0. Substitute Kyah Simon added the final Dash goal in the 84 minute. This time Latsko would contributed with an assist. Latsko looked to Daly in the box who dummied the pass right to a streaking Simon for the right footed finish the match.Washington Spirit Sullivan almost brought one back but the crossbar denied the rookie midfielder. The Houston backline of Polkinghorne, Allysha Chapman, Amber Brooks and Comeau stifled all Spirit attacks allowing goalkeeper Jane Campbell to earn her third shutout of the season. The Houston Dash will continue their playoff push when they travel to Seattle Reign FC August 21. Washington Spirit will host the Utah Royals FC for the first time on August 22.